Sunday April 10th 1881 I did not go to church this morning but was busy about the house all the forenoon. I went to town as soon as I could get ready after dinner and Win and I went to the catholic church to vespers. We called to see Ed Garretson and his bride and was at Aunty Walkers. Mother and May was there and I came home when they did. I played on the piano in the eve. 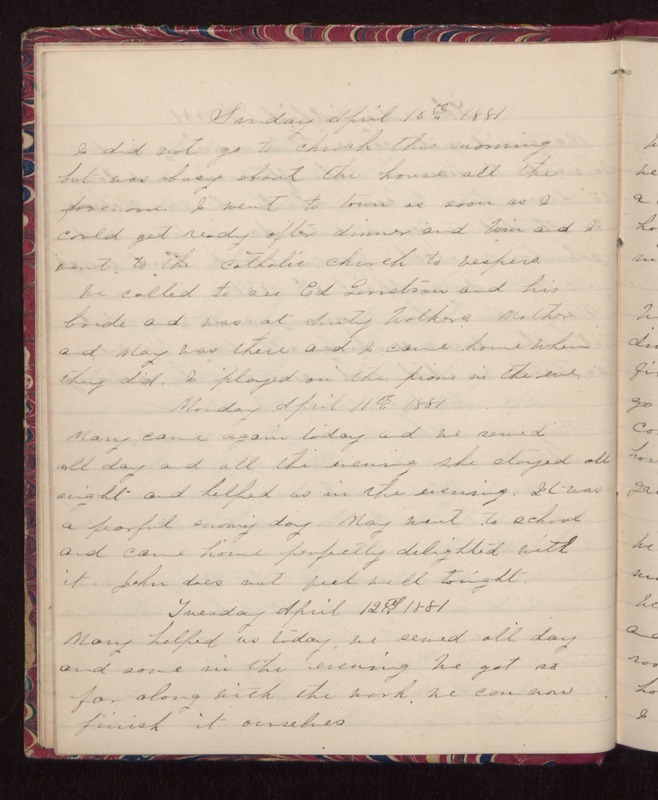 Monday April 11th 1881 Mary came again today and we sewed all day and all the evening. She stayed all night and helped us in the evening. It was a fearful snowy day. May went to school and came home perfectly delighted with it. John does not feel well tonight. Tuesday April 12th 1881 Mary helped us today. We sewed all day and some in the evening. We got so far along with the work we can now finish it ourselves.